and sorties the Yamaguchi Hikari base. on February 21, 1945.
and they said good-bye of the last to the mountains and rivers of their country. The meaning of an officer's Guntō is directly expressed by the navy sword. The naval officer unrelated to a hand-to-hand combat carried the Guntō why. The Guntō and the dirk were the symbol of an officer's status, and the symbol of honor and pride. When becoming so much, the purpose was fully able to be achieved also with the dirk. Apart from the Guntō, although there were a ceremonial-arms sword and a saber, the Guntō made this use serve a double purpose in the battlefield. The saber Guntō of an one hand grip fitted it by the thin figure blade. Officers liked and chose not a Western blade but the blade of a Japanese sword also as the time of a saber Guntō. This is a tendency common to the officers of an army and the navy, consequently the alteration to a Tachi type Mounting was performed. Although an officer's Guntōes serve both as a ceremonial-arms sword or a saber in a battlefield while being arms, a more important thing than it is because a Guntō is carried. It is that the element of mental encouragement and a mental feeling of sufficiency was very large. It may call it "the spiritual ground" as a soldier. It is enough that the Mikasa sword and the Mikasa dirk made from the steel of the subgun of the flagship "Mikasa" of the combined fleet of "the naval battle of the Japan-Sea" were naval officers' objects of adoration etc. to support that. 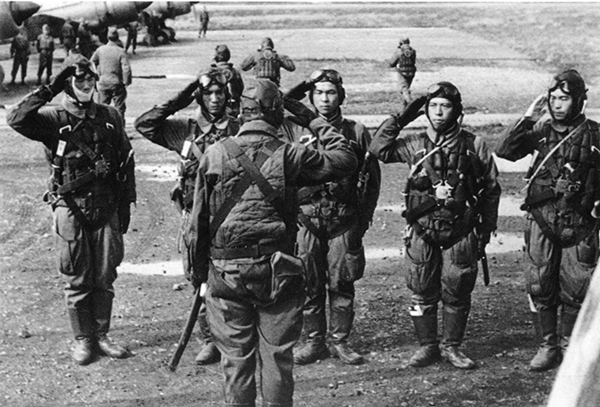 In moreover, the last stage of war, a state that the officer of the flying corps who sorties at a Suicide Attack gets into an airplane together with a Guntō, and a state at which the members of the Suicide Attack Unit of a Human Bomb "Kaiten" sortie by submarine with a Guntō is the typical example. What is the Japanese sword which could become an officer's emotional prop ? The "sword" was the object of the faith which transcended arms, though it was arms, and it was the important sacred treasures of religious service or courtesy a long time ago (the age of the gods). A sword changes a figure to a Tachi and a sword unique to Japan soon. A mystical atmosphere which these swords brew charmed people completely. It was considered that a sword was the special existence which is the symbol of not arms but mere wealth and power, and conceived the spiritual life. Since then, Japanese people have continued holding a thought of reverence and veneration continuously to the sword called a "Japanese sword" in future generations. Just the difference of a grade continuing being useful to Japanese feeling until the consciousness of that, the sword of the precious article blood relatives' genealogy, and a sword for self-defense results soon. Here is one of the reasons of why the blade of the Guntō which an officer carries has many Japanese swords. In order to respond to the Guntō demand to expand in addition to a Japanese sword from ancient times, many practical use blades were also made. The essence of a sword is splendidly declared by "the sword and head picking" of Masaya Suzuki work. The main arms of the Age of Civil Wars were "bow and spear"→ "gun". If swords are the arms with a main battle, there is inconsistency of pretending the blade which is surely damaged and is abandoned by battle in the world of the Warring States by a gorgeous Koshirae. I cannot think that the samurai was irrational to there. Naturally in long history, the sword which is arms was used for the individual match, or the partial battle and close-range battle of a small group. However, the meaning of the sword of "a systematic group fights" was the symbol of a general's status, and was protection and a sword for self-protection. When the swords were the main arms, naturally the structure of a Hilt(Tsuka) and a Tang(Nakago), and a blade and a Mounting(Koshirae) must have been improved after that. The army consists of an officer, a noncommissioned officer, and a private. The Guntō was paid to a noncommissioned officer and a part of private, as arms. A private cannot carry a Guntō fundamentally. In the private, the Cavalry and the military policeman were able to carry the Guntō. The Guntō of the noncommissioned officer and a a private who fights by the front line, was strongly built as "arms"
The Guntō of the personal equipment of the officer who commands a noncommissioned officer and a a private had the difference in performance and intensity naturally from the difference in a role with them. Rather, was there any true hand-to-hand combat by a modern warfare ? A mutual army finishes shooting a bullet, the last's fighting is a hand-to-hand combat using a bayonet or a sword. An effective distance of a Japanese sword with a length of a little more than 100cm is slight, or does not have 1m, either. The Japanese sword is completely powerless to an enemy with a gun, and it was not able to compete with a bayonet. When the directions of the Guntō in the battle line of China of those days are seen in history, they are the close-range battle of an occurrence, ascendancy of a Beni-hei, the annihilation battle of the fleeing enemy, and the unavoidable hand-to-hand combat that depends on the shortage of a bullet. With the hand-to-hand combat assumed depending on how to use a soldier, it is widely different. Furthermore, it differs from the China army, the Gunto against the U.S. and U.K. armies which boiled quality and quantity markedly and carried out modern equipment did not become arms . As for this, a meaning is hand-to-hand combat different although there is an example at which the Japanese army which it finished shooting with a bullet rushed the last with the Guntō and the bayonet. The meaning of the Age of Civil Wars and a sword in already "an organization battle" had become settled. Therefore, it can be said that the essence of an officer's Guntō was "The sword to command", "the symbol of a status", "a protection sword", and "a spiritual ground". So, the conditions with which an officer's Guntō is equipped are "the blades of reverence ※1", and are a "fashion" suitable to it. The Koshirae of an old Tachi or Uchigatana was widely different with present-day practicality, and the Western sword Koshirae did not adapt itself to Japanese people. The Japanese sword ※2 and the modernistic Tachi Koshirae" were the one answer. blade of a Tamahagane is not pointed out. The Mikasa sword etc. is the typical example. ※2 The Japanese sword as used in the field of here refers to the Japanese sword of a wide sense.